KoopaTV: A dEAl With The DEVIL? By LUDWIG VON KOOPA - "EA" is supposed to stand out in that title. Based on my analysis yesterday of Punch-Out!! and its Western performance, one should wonder why Nintendo doesn't exploit this nostalgic series more. It turns out they did during the Nintendo GameCube era — along with a lot more dark and disturbing exploitations. And now my usage of the word "exploit" is going from "utilizing a business opportunity" to something much more... sinister. I'm referring, of course, to Nintendo's GameCube-era partnership with Electronic Arts around 2005. This was the time when Nintendo allowed EA to use beloved properties to sell multiplatform games. 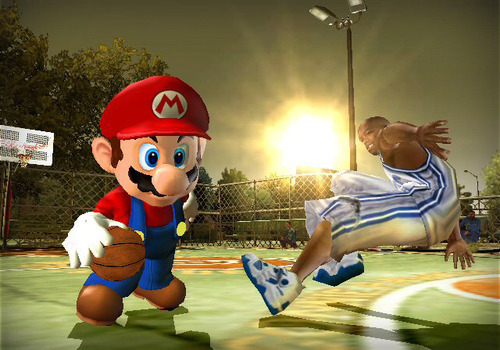 So NBA Street V3 had Mario, Luigi, and Princess Peach. SSX On Tour also had Mario, Luigi, and Princess Peach. The GameCube versions of these games didn't sell as well as their Xbox and PlayStation 2 counterparts, despite the Mario-based marketing. It's pretty obvious why that'd be the case. People don't buy third party games from evil assholes just because Mario is in it (and looking completely out-of-place). EA just wasn't content with only attempting to ruin Square beforehand. Mario's nose is literally as big as the other dude's head. However, the GameCube version of Fight Night Round 2 was a completely different scenario. Because from the start of the game you're granted a complete emulated version of the SNES game Super Punch-Out!!. And if you beat that, you could play as Super Punch-Out!! 's nameless protagonist in the actual Fight Night Round 2 game... which EA renamed "Little Mac". Even though he's blonde and the real Little Mac has black hair. And was originally nameless because of the fact he's explicitly not Little Mac. So Nintendo just let EA try to retcon Nintendo's own series. But I guess in the end, Nintendo retconned EA's retcon anyway because no one brought up the events of Super Punch-Out!! ever again. Notice in the Fight Night Round 2 video above, which was produced by EA, features "Mac", Super Punch-Out! !, and the boxarts of the GameCube, PS2, and Xbox versions. Even though the GameCube version has Super Punch-Out!! as an exclusive, supposedly because the PS2 and Xbox versions have online play and the GameCube version doesn't. The inclusion of Super Punch-Out!! was originally going to be a bonus unlockable, but I guess for marketing purposes it was bumped up to out-of-box access. I know back in 2005 when I was reading about Fight Night Round 2 and read that Super Punch-Out!! was going to be playable, I honestly considered actually buying an EA game just to play Super Punch-Out!! because Punch-Out!! NES (from Animal Crossing) was just that good. This was a completely different circumstance than just shoving Mario into some game. However, from this video we can tell that EA was trying to sell GameCube-exclusive features as features in the Xbox and PS2 versions of the game, too. Which makes sense if you consider the "move on to other pastures" line from yesterday's article. Despite two games in one, critics valued online play more and denounced the GameCube controller's C-stick for the main game, so the GameCube version has a lower Metacritic rating (88 and 88 vs. 87). Oh, and it got lower sales. That's why Nintendo is probably doing something different with third-party outreach this time around with the Wii U. Instead of just throwing Nintendo guys — wait, what? Oh, I'm obligated to mention Soulcalibur II? It sold the most with Link in it? Well, there. That was clearly an exception. Anyway, that's why Nintendo is doing different stuff. Like helping co-publish things. I mean, we still have the occasional Nintendo cameo (Rayman Legends Mario skins?) in a third party game, but Nintendo basically has made PlatinumGames a second party developer. SEGA too. Nintendo is paying for exclusive titles like Sonic Lost World, The Wonderful 101, and Bayonetta 2. Is this more effective overall? We'll see, because at least the GameCube actually got third party support without Nintendo exerting this huge extra amount of effort. There is also the matter of the direct crossover. Nintendo first decided to partner up with Tecmo Koei with releasing Samurai Warriors 3 exclusively on the Wii. They helped develop a Mystery of Murasame Castle mode in there with Takamaru. You know, that irrelevant guy. Despite this, the game lost its Wii exclusivity later on. Regardless, this partnership eventually developed into Pokémon Conquest, which is absolutely the best way for third party companies and Nintendo to establish both sales and relationships. I literally would've never bought Pokémon Conquest if it didn't involve Pokémon. This wasn't just throwing Pokémon into Nobunaga's Ambition — We had equal parts from each half of the crossover. It felt legitimate and synergistic. We'll see how Atlus does with Shin Megami Tensei X Fire Emblem. Nintendo has the strongest character-based franchising in the videogame industry, so it can't hurt sales to stuff some characters into any given game. But it can damage reputation. This way at least, the threat of ruining the in-canon establishments of Nintendo's respective franchises isn't at risk. I would say the Punch-Out!! series took a hit thanks to Electronic Arts. Fight Night Round 2 was the easy excuse not to have a GameCube Punch-Out!! game, after all. And it shamed the franchise. Mario was shamed too, but who cares about his reputation? If there was enough to write about Pokémon Conquest to do a week of that, Ludwig would do it. Otherwise, it should be expected that KoopaTV would find a way to bash its enemy — Electronic Arts — during Punch-Out!! week and make it relevant. Follow Ludwig at NNID PrinceOfKoopas... just because. To finish off the week, we have a special gift. For more analysis on Tecmo Koei's crossovers, click here.